So you think Subaru is popular in the U.S.? 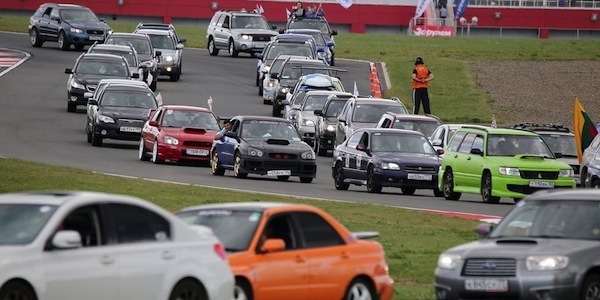 Russian Subaru enthusiasts are bigger fans and have a new Guinness world record to prove it. An event called SubaFest in Moscow Russia is where Subaru set a new Guinness Book Record for having the largest Subaru parade of their vehicles. It’s the biggest Subaru event in Russia and it took place last weekend at Moscow Speedway. This year, SubaFest brought together about 4000 visitors and more than 1,000 Subaru vehicles. Subaru Russia set out to set the record held by the Americans and the race was on this past weekend. In order to get into the Guinness record book, the Russians had to bring at least 400 Subaru cars to beat the old record held in the U.S. set on July 13, 2013 with 371 cars. Russian Subaru owners surpassed the Americans and set a new record with 549 Subaru vehicles. This was no easy task as participants had to follow strict rules to set the record. The Subaru vehicles had to all travel 3 kilometers non-stop and could not exceed a distance equal to more than two car lengths. It took the participants 2.5 hours to complete the record while moving at a speed of about 5-7km/h at the Moscow Raceway. During the presentation of the certificate on the new record, Glen Pollard, a spokesman for Guinness World Records Ltd., which registered the Russian Subaru achievement said: "This record is very complex from a technical point of view. It is important to the effort of each participant, because one mistake can cost a person the record. But today you have proven that together you can achieve a lot. So today I solemnly declare that you are officially awesome! " There was every kind of Subaru at the event you can imagine, Foresters, Outbacks, WRX, WRX STI, XV Crosstrek and Impreza vehicles that took part in the new Guinness World Record. The Russians now hold the distinction that they love the brand more than Americans. It’s only a matter of time before loyal fans in the U.S. attempt to take back the record. Stay tuned.